The stakes are high for the ride-hailing market in Southeast Asia. Two big competitors, Grab and Uber, are competing to gain market share, which is expected to become a $13 billion industry by 2025. Since its inception 4 years ago, Grab has created a strong foothold in Southeast Asia with funding support of $750 million by Softbank in September 2016 and has great plans to advance further in the region. On the other hand, Uber’s recent move of selling off its China unit to DiDi in August 2016 is a clear indication that they are focusing their expansion efforts in Southeast Asia as well. This is apparent as Uber has been doubling down on resources, staffing and technology. While this sounds great for consumers, the ride-hailing industry is getting intensively competitive in the region. This study was conducted to compare and identify the cheapest mode of transportation between the two ride-hailing giants with local taxies in each major Southeast Asian country. 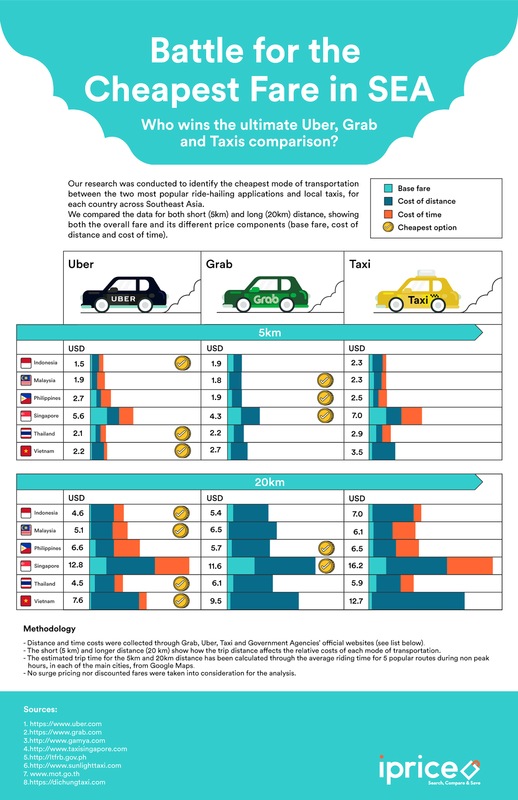 Our research in Southeast Asia takes in account on price differences by Grab, Uber and taxies based on various price components and price points. In the Philippines, based on moderate traffic in non-peak hours, people spend on average 30 minutes for 5 kilometers travelling within the city center. As such, consumers prefer Grab as it costs about 95 Pesos as compared to Uber at 135 Pesos and taxies at 125 Pesos respectively. We see a similar trend as well in farther distances as it would cost 285 Pesos by Grab, 330 Pesos by Uber and 325 Pesos by taxies when travelling from the city center to suburban areas of 20 kilometers radius at about 80 minutes of travelling time. As of 17 November 2016, Uber is still widely unavailable in the country because of the absence of Google turn-by-turn navigation needed by the app, except in Manila. Grab is available in major areas of the country such as Manila, Cebu and Davao. Infographic submitted by Benjamin exclusively for kwentology.com. Hi, I'm Benjamin Sim, today, my team and I just finished our latest infographic case study about “Battle for the cheapest fare in SEA. UBER, GRAB or TAXI?”. Observing the growth of ride-hailing industry in SEA, pros and cons of the regulation and high demand for good and cheap public transportation, I wanted to share this study for the first time to Kwentology, you and your fellow readers. Thank you for reading Battle for the Cheapest Fare in Southeast Asia posted on the website Kwentology if you want to redistribute this article please include the link as the source. Have some kuwento to share? Contact us!